Mathematics is not only a set of addition or multiplication rules, but also a whole way of thinking and reasoning. In order to understand and enjoy math, students need to know not only how the rules work but also why they work this way. We believe there are three important components to successful learning: understanding, practice and problem solving. Our main goal is to teach math skills and give children a solid foundation as well as to develop in children the love of mathematics and of the intellectual process in general. 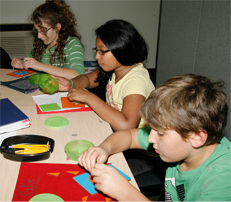 Our program offers a variety of problems which ensures deep understanding, and which children love to solve. Our classes are small (usually 4-5 students). The children are matched together by their ability, knowledge, and age to make the lessons more efficient. Each lesson is prepared individually to create the best learning rate and provide deeper understanding. A teacher discusses concepts and rules with the children, then lets each child practice to make sure the material is understood. The children are encouraged to think, to create their own techniques, and to share their ideas. The classes are small enough for the teacher to clearly see if the children understand the material, and to help if there is a problem. Our teachers love math; our goal is for children to love math too! Anna Talitskaya received a B.S. 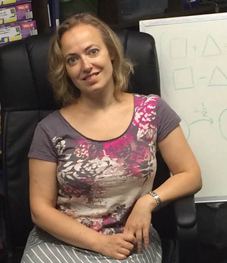 from Moscow State University, Department of Math, then a Ph.D. in math from PennState University, She has almost 20 years of teaching experience at middle and high schools as well as at universities.While looking for a better math education for her children she realized a few fundamental things which correspond to a quality math education. As a parent and a mathematician, she wanted her kids to not only understand how to solve standard problems or how to follow certain rules, but to also understand what those rules or methods are based on. The material had to be flexible enough to provide different methods for kids to decide which is the most appropriate. 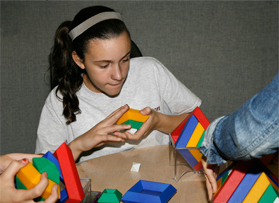 Math is a great way to learn to think analytically, so logic problems prepare kids for the future geometric proofs. Of course children have to be involved in the learning and enjoy it. Math teachers have to love math themselves as their enthusiasm is contagious. After doing a lot of research Anna came up with a combination of the Russian traditional fundamental approach together with logic and analytical material to develop reasoning. It has been very rewarding to watch the children learn and grow, and see how their eyes light up when they figure out a difficult problem.